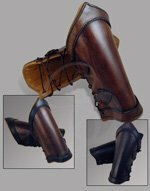 This Pilum is a re-creation of later Roman footman styles (circa 100 A.D.). It features a long shaft wrapped with rope and a heavy steel triangular tip. 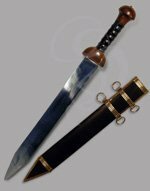 The shaft is riveted powerfully to an angular wooden guard that is reinforced with the standard wide and flat tang of the shank. This guard would have protected the legionnaire's hand. The legionnaire could also have wedged this guard against the inside of his shield, making it more difficult for someone to pull the pilum out of his hand. 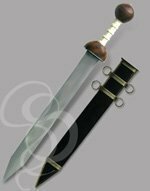 The heavy gaurd and long wooden shaft gives the spear a nice weight and would have helped a Roman soldier penetrate his opponent's shield. 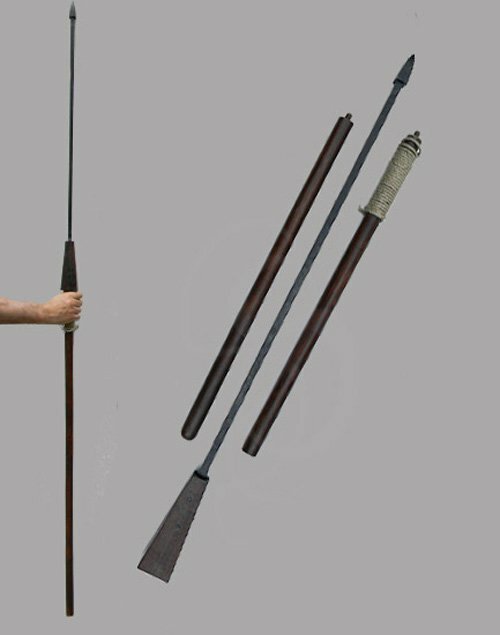 The Pilum comes in three pieces - This is great for transporting the spear.